As I write this, I am sitting on the beach in Puerto Vallarta, Mexico (well not really...I'm in the patio of our condo, where I can pick up a wifi signal). I was trying to come up with an article for this week, that had something to do with a quick getaway from my mountain home. Mexico is known for its' strong tequila, mezcal, and range of beers. Certainly we've all seen the Corona and Dos Equis commercials, and I've had a few already down here (not too much on the wine front in this part of Mexico, but we did go to a wine tasting on Monday, that was not very good...put on by the Tianguis Turistico). While Mexico certainly does make these beverages, it doesn't do justice to the sophistication of some of the tequilas or beers being produced. I will admit that Mezcal is still shaking off its "bad boy" reputation. A year ago, I wrote an article about Tequila, and my trip to the Agave fields of Mexico. I've also written about the process used to make spirits, so I thought I'd take a look at some of my favorite "umbrella drinks"...you know, those drinks you only have when you are on vacation at the beach. Obviously the first drink that comes to mind when in Mexico is a Margarita. 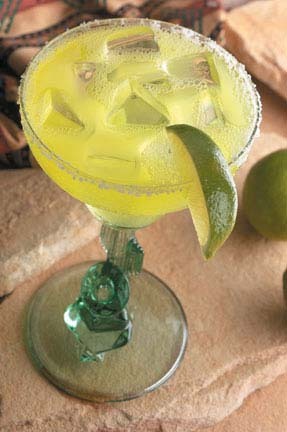 There is a good recap of the history (maybe) of the Margarita at the Cactus Club website, however, I have also heard that the Margarita was created at Hussongs Cantina in Ensanada, Mexico. The best I can tell, the authentic recipe is pretty simple: Rub the rim of the glass with the lime slice to make the salt stick to it. Shake together ingredients (7 parts Tequila, 4 parts Cointreau, 3 parts lime juice) with ice, then carefully pour into the glass (taking care not to dislodge any salt). Garnish and serve over ice. 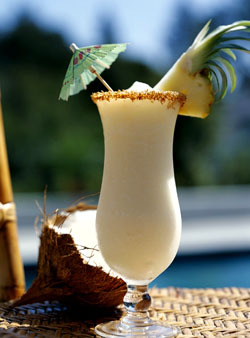 The classic umbrella drink while on a tropical vacation is the Pina Colada. The history of the Pina Colada appears to start in Puerto Rico. Here is a link to a good recap of the history. The recipe for a good Pina Colada is to pour 1.5 oz. rum, 2 oz. cream of coconut and 2 oz pineapple juice into a blender with one cup of crushed ice. Blend until smooth, and pour into a collins glass. Garnish with a slice of pineapple and a maraschino cherry, and of course an umbrella. A similar drink to a Pina Colada is the Chi-chi. I can't find much history on the Chi-chi, other than it was a take off of the Pina Colada, but made with Vodka, even though there are a few more ingredients in the "authentic" recipes I uncovered....Put in a shaker that is filled with 50% ice: 3 parts Vodka, 5 parts pineapple juice, 2 parts Crème de Cacao, 1 tsp, grenadine syrup, and the juice of one lemon. Shake, and pour into a tall glass. One of the oldest beach cocktails, appears to be the Daiquiri. History suggests that it was created in Cuba around 1901. 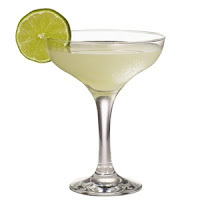 The most authentic recipe I can find says to combine 2oz white rum, 1oz fresh lime juice and 1/2 oz simple syrup in shaker with ice and shake well. Pour drink in a chilled cocktail or martini glass and garnish with a lime wedge or mint leaf. I always thought that the Mai-tai was an authentic Hawaiian drink, but according to history buffs... it looks like it was a California creation. Since some of the rums originally listed for making an authentic Mai-tai are not available anymore, here is the best/closest authentic recipe I could find: Hand shake all of the ingredients (1oz Jamaican rum, 1oz Martinique rum, 1/2oz orange Curacao, 1/2oz almond syrup, 1/4oz simple syrup, and the juice of one lime) briskly with crushed ice for at least 20 seconds. Serve the Mai Tai in a double old-fashioned glass. Garnish your Mai Tai cocktail with a fresh mint sprig. Yeah, I know, these are the drinks the tourists drink. 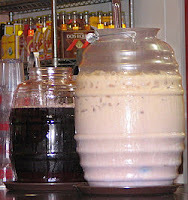 But, when you are walking around the mercado, and talking with the street vendors, there is always someone selling the traditional cold drinks of Mexico from carts on the streets. We have stopped for some coconut water, but didn't try the Juino Tuba (a fermented drink made from palm tree sap). 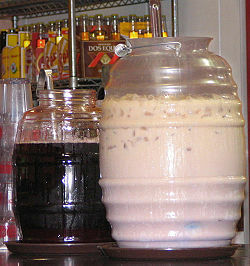 The most famous are Horchata (made with rice, almonds, cinnamon, and sugar), Licuados (various fruits mixed with orange juice or milk then mixed in a blender), and Aguas Frescas (made with fruit and water and again. blended). Luckily, I'm one of those people with an "iron stomach" so I will dare to eat and drink anything. So far so good! What's in the Wine Cellar? For months now, a friend of mine has been asking me to come over to her house, and look through the bottles in her wine cellar. She had told me that there might be some old Bordeaux and Burgundy in there, but she wasn't sure what she had. We finally got together (along with a few friends), and made an evening out of it. We all brought some wine..."just in case". I had seen her cellar a number of years ago, but really didn't pay much attention to what was inside. Well, I should have! What I found upon entering her cellar was a room without any humidity or temperature control, and everything was covered in dust. Since the cellar backed up to the hillside, the temperature appeared cool enough, but I couldn't judge the swings in temperature. My biggest concern was the humidity. We live at 5,200 feet in the mountains. Our air is thinner, and definitely drier at this altitude, which can play havoc with wine corks. We gathered some towels, and started carefully wiping down the bottles to see what we had in stock. There were a lot of old bottles of California Chardonnay and Sauvignon Blanc, most of which had turned brown in the bottle. We even found a 1989 Sutter Home White Zinfandel. Then our luck turned around a bit. We discovered about 10 bottles of German Riesling: 1987 Klusserather St. Micheal QbA. Next we found six bottles of White Burgundy: 1983 Clos Du Chateau Meursault. We thought each of these white wines might have potential to have survived their storage treatment, so we carefully moved one bottle of each to the refrigerator. I purposely chose the bottles that had, what appeared to be, the softest corks...in hopes the ones we left in the cellar would be in better shape. More on the tasting later. Then, things got a bit more interesting. We came across one bottle of 1986 Clos Vougeot (Red Burgundy - Pinot Noir), then a bottle of 1990 Chateau Ducru-Beaucaillou St. Julien Bordeaux, followed by a 1980 Chateau Baronne Phillipe Rothschild (later known as Chateau Armailhac), and a 1961 Bolla Amarone Cantina de Nanna. Then, what we hoped were the finds of the evening: 1-bottle of 1971 Cheval Blanc, and 3-bottles of 1966 Chateau Latour. I had brought all my old vintage charts, and my Bordeaux Chateau book, to look up tasting notes on the wines. We knew that there were some bad vintages in the bunch, but held out hope for the Chateau Latour (which was still wrapped in its' original tissue paper). It's always that age old question of Drink or Hold. We opened the two whites first. The Riesling was past its' prime, but you could taste what it used to be. The petrol aromas were pretty evident, but any notes of sweetness were long gone.The remaining bottles may be better, but I doubt it. The white Burgundy (Chardonnay) was all yeast, and was golden in color...but nothing drinkable. Next we moved to the reds. As I cut into the foil caps, I could tell we had issues. Almost every bottle had leakage, and mold on the cork and capsule. The next challenge was getting the corks out of the bottle in one piece, which didn't happen too often. While I can say I tasted a 1966 Chateau Latour, I can't tell you how good it was, as it had turned. Not to vinegar yet, but was beyond its' lifespan. I'll tell you, there is nothing more depressing than watching Cheval Blanc or Chateau Latour being poured down the drain! To try and save the evening, we opened up a 1987 Heitz Martha's Vineyard Cabernet Sauvignon. For the first five minutes, the wine was still there. You could taste a bit of remaining fruit, but the tobacco and leather notes were soon overtaken by an oxidised brown flavor. For five minutes, we were loosely transported back to 1987. We spent a total of five hours going through the cellar, eating dinner and appetizers, and tasting the wines we hoped had survived. In the end, the Brunello and Petite Verdot we had for dinner, proved to be the best wines of the evening. But the chance to try these wines was something to remember, and a true testament to properly storing your wines. Now might be a good time to review proper storage techniques, and save those valuable wines! 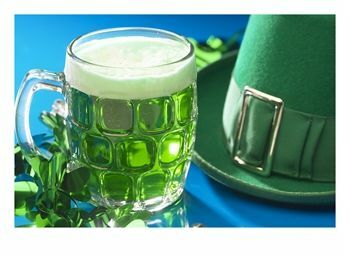 On March 17th, everyone is Irish. We all remember growing up as kids, and having to wear green on St. Patrick’s Day, or else you would get pinched. Now, as grownups, we celebrate the “wearing ‘O the green”, by hoisting a few Stouts at the local bar. Ireland is renowned internationally for its beverages. The pub culture is legendary (whether deserved or not). So what do the Irish drink? The most notable drinks are beer and whiskey (note that in Ireland, whiskey is normally spelled with an “e” in the word...rumor has it that this has to do with Catholic spelling versus Protestant spelling). Ireland is also known for their Mead, a honey wine. 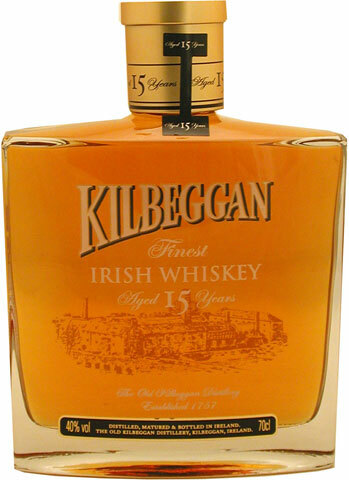 The first commercial whiskey was established in Ireland in 1757: Kilbeggan Distillery. There are currently only four operating distilleries in Ireland, they are: New Middleton Distillery (Jamesons, Powers, Paddy, Midleton, and Redbreast); Old Bushmills (all Old Bushmills, Black Bush, 1608, Bushmills 10-, 12- and 16- and 21-year-old single malts), Cooley Distillery (Connemara, Michael Collins, Tyrconnell, Feckin and others) and Kilbeggan. Another well-known brand is Tullamore Dew (now Scottish owned and operated, but still produced in the New Middleton distillery). Irish whiskey must be distilled and aged in the Republic of Ireland or in Northern Ireland. The contained spirits must be distilled to an alcohol by volume level of less than 94.8% from a yeast-fermented mash of cereal grains (basically beer) in such a way that the distillate has an aroma and flavor derived from the materials used. The product must be aged for at least three years in wooden casks. If the spirits comprise a blend of two or more such distillates, the product is referred to as a "blended" Irish whiskey. Traditionally, Irish whiskies are distilled three times for extra smoothness (Scotch whisky by comparison is traditionally double distilled). Beer is still a favorite drink for the mass population in Ireland. At one time, there were over 200 breweries in Ireland, mainly centered around Dublin. Today, there are only 12. 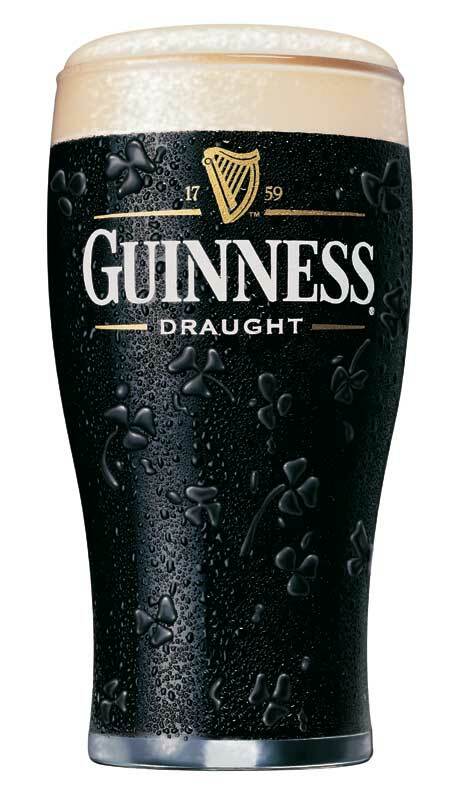 Ireland is most popularly associated with Guinness Stout, but Stout only makes up about 32% of all beer produced. 63% of beer production is actually lager. Harp is the most popular lager in Ireland. Other noteworthy malt beverages include Smithwicks, Kilkenny, Murphy's and Beamish. Ciders are also quite popular. 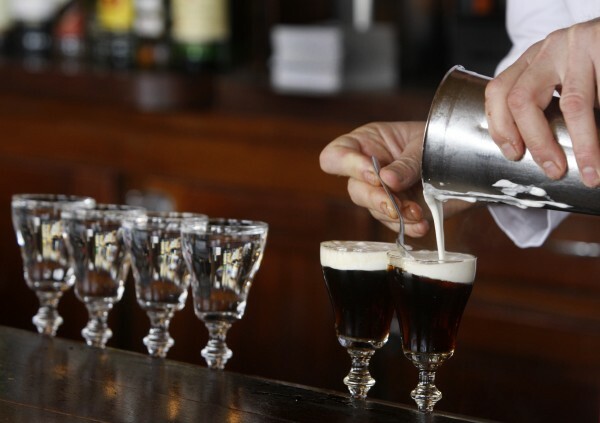 Another popular drink for St. Patrick’s Day is Irish Coffee, however, this may, or may not have been created in Ireland. While it appears to have come from Ireland, it’s popularity, and history starts at the Buena Vista Café in San Francisco, in 1952. To make an Irish Coffee (Buena Vista Style), fill a six-ounce goblet with hot water to heat, then empty. Pour hot coffee into hot glass until it is about three-quarters full. Drop in two cocktail sugar cubes. Stir the sugar until completely dissolved. Add a full jigger of Irish Whiskey. 48 hour aged cream (frothed to a precise consistency) is carefully poured over the back of a spoon initially held just above the surface of the coffee and gradually raised a little. The layer of cream will float on the coffee without mixing. The coffee is drunk through the layer of cream. So what if you are preparing the traditional Corned Beef and Cabbage for St. Patrick's Day? What should you drink with that? I have a couple suggestions: 1) if wine is your choice, try a Beaujolais Village (Morgon, Moulin-a-Vent, or Regnie); 2) Beer...go with a stout or dark lager. And, after all that, did you know that the Irish drink more tea per capita than any other nation on earth? Whenever French wine is mentioned, Bordeaux and Burgundy are usually part of the discussion. When talking about Italy, what comes to mind? Chianti? Brunello? Amarone? How about Barolo? Ah yes...Barolo! Located in the northwest corner of Italy is the Piedmont region, which stretches from the Mediterranean coast to the Italian Alps. The best wine growing areas are found in the rolling alpine foothills, where the soil is dominated by calcareous clay. There are stories that the best growing locations were determined by watching the snow melt on the hillsides. Grapes were planted on the first locations to melt, so the growers could obtain the longest growing season. A number of grapes are grown in the Piedmont region. White grapes are Cortese (Gavi), Erbaluce, Arneis, Chardonnay, and Moscato (Moscato d'Asti, or many of you may remember Asti Spumante). Red Wine grapes are Dolcetto, Brechetto, Grignolino, Barbera, and the one we'll concentrate on: Nebbiolo. 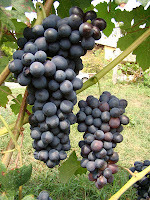 Nebbiolo is a late harvesting grape. So late in fact, that the name of the grape comes from the fog ("nebbia") that is so prevalent at harvest time.Nebbiolo is the exclusive grape in the famous wines of Barolo and Barbaresco. The grape produces orange/red wines, with high tannin, high acid, and high alcohol. As you might expect, these wines tend to need age and/or decanting to truly be appreciated. Barbaresco is the "queen" (lighter version) to the "king" of the region...Barolo. There are five communes that are considered the best growing areas for Barolo, and within those communes there are locations that are considered the choice sites. 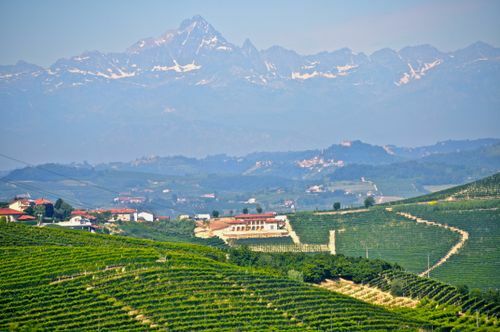 The two communes of Barolo (choice sites: Brunate, Cannubi, Sarmassa) and La Marra (choice sites: Arborina, Cerequio Marcenasco) produce lighter, plush, more perfumed wines. These wines are best suited for shorter aging periods. The remaining three communes produce a denser, richer, deeper colored wine. Those three communes are: Castiglione Falleto (choice sites being Monprivato, Rocche and Villero), Monforte d'Alba (choice sites are Bussia, Ginestra, and Santo Stefano di Perno), and Serralunga d'Alba (choice sites to try are Lazzarito, Ornato, and Vigna Rionda). 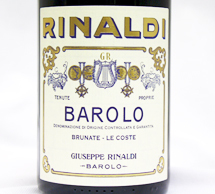 The "best" Barolos are intense, complex wines with aromas of roses, plums, leather, licorice and tar. In the palate, there is sweet, savory and spicy...all in one. As I said, complex and intense. When purchasing Barolo, you need to consider style. Remember two communes offer more finesse, while the other three offer power. Those first two also don't require as much aging, so they are more accessible for those that want to consume now. As with most wines, vintage is important too. There are a number of very good vintages going back to what is considered the classic vintage of 2000. When searching for Barolo, look for 2000, 2001, 2004, 2005, 2006, 2007 and 2008. At the prices you'll be paying, don't bother with 2002 or 2003. The 2009 through 2011 vintages have not been released yet, as Barolo is required to be aged a minimum of three years (2 in barrel). I mentioned price...these are not inexpensive wines, but that doesn't mean can't afford them. Unlike the inaccessible Bordeaux or Burgundies, Barolo is still reasonable for what you get. As a hint, I been finding some very good prices on the www.wtso.com website. So, why the "king" of Italian wines? There is a saying about Barolo...."It is the king of wines, and the wine of kings". I look forward to hearing about your Barolo finds, thoughts and food pairings. These wines are some of my favorites, and I hope you have a chance to try them too!